Paul Weller Meets Tokyo Chef! – Paul Weller News! Paul Weller Meets Tokyo Chef! Modfather Paul Weller Meets Popular Pastry Chef In Tokyo! 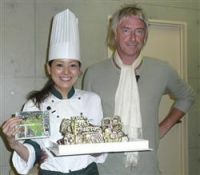 British rock singer Paul Weller, 50, took time out to visit popular Japanese pastry chef Aya Kakizawa, 31, in Shibuya. Kakizawa will operate a vegetable pastry shop during the Summer Sonic 08 music festival which Weller will take part in this weekend at Makuhari Messe in Chiba Prefecture. Previous Entry Paul Weller Set List From Summer Sonic Festival In Tokyo! Next Entry Photos & Set List From Paul Weller’s Appearance At Summer Sonic, Osaka!